In humans, the heart is a pulsating organ that pumps blood throughout the body. On average, the heart weighs about 10.5 ounces (300 grams). It is a four-chambered, cone-shaped organ about the size of a closed fist. It lies under the sternum (breastbone), nestled between the lungs. The heart is covered by a triple-layered, fibrous sac called the pericardium. This important organ is protected within a bony cage formed by the ribs, sternum, and spine. Angina pectoris: Chest pain that occurs when blood flow to the heart is reduced, resulting in a shortage of oxygen. Aorta: Largest blood vessel in the body. Atherosclerosis: Condition in which fatty material such as cholesterol accumulates on an artery wall forming plaque that obstructs blood flow. Atrioventricular node: Area of specialized tissue that lies near the bottom of the right atrium that fires an electrical impulse across the ventricles, causing them to contract. Atria: Upper heart chambers that receive blood. Diastole: Period of relaxation and expansion of the heart when its chambers fill with blood. Mitral valve: Valve with two cusps that separates the left atrium from the left ventricle. 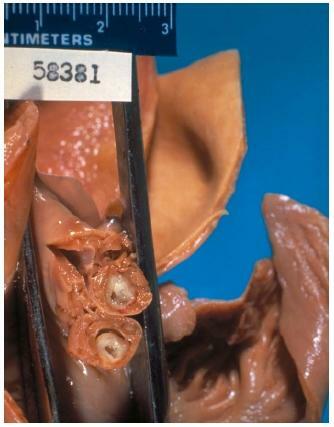 Pericardium: Fibrous sac that encloses the heart. Sinoatrial node: Area of specialized tissue in the upper area of the right atrium that fires an electrical impulse across the atria, causing them to contract. Systole: Rhythmic contraction of the heat. Tricuspid valve: Fibrous, three-leaflet valve that separates the right atrium from the right ventricle. Ventricles: Lower heart chambers that pump blood. In its ceaseless work, the heart contracts more than 100,000 times a day to drive blood through about 60,000 miles (96,000 kilometers) of vessels to nourish each of the trillions of cells in the body. Each contraction of the heart forces about 2.5 ounces (74 milliliters) of blood into the bloodstream. This adds up to about 10 pints (4.7 liters) of blood every minute. An average heart will pump about 1,800 gallons (6,800 liters) of blood each day. With exercise, that amount may increase as much as six times. In an average lifetime, the heart will pump about 100 million gallons (380 million liters) of blood. The heart is divided into four chambers. The upper chambers are the atria (singular atrium). The lower chambers are the ventricles. The wall that divides the right and left sides of the heart is the septum. The atria are thin-walled holding chambers for blood that returns to the heart from the body. The ventricles are muscular chambers that contract rhythmically to propel blood through the body. Movement of blood between chambers and in and out of the heart is controlled by valves that allow movement in only one direction. Between the atria and ventricles are atrioventricular (AV) valves. 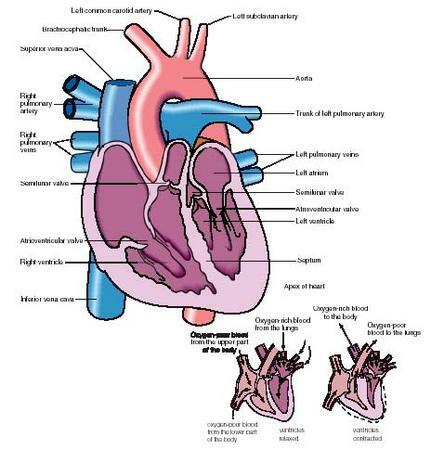 Between the ventricles and the major arteries into which they pump blood are semilunar (SL) valves. The "lub-dup" sounds that a physician hears through a stethoscope occur when the heart valves close. The AV valves produce the "lub" sound upon closing, while the SL valves cause the "dup" sound. Blood carrying no oxygen (oxygen-depleted) returns to the right atrium of the heart through the vena cava, a major vein. It then passes through the tricuspid or right AV valve into the right ventricle. The tricuspid valve is so named because it has three cusps or flaps that open and close to control the flow of blood. When the right ventricle contracts, blood is forced from the heart into the pulmonary artery through the pulmonary SL valve. The pulmonary artery is the only artery in the body that carries oxygen-depleted blood. It carries this blood into the lungs, where the blood releases carbon dioxide and other impurities and picks up oxygen. The freshly oxygenated blood then returns to the left atrium through the four pulmonary veins. The blood then passes through the mitral or left AV valve into the left ventricle. The left ventricle has the hardest task of any chamber in the heart. It must force blood from the heart into the body and head. For that purpose it has a much thicker wall, approximately three times thicker than the wall of the right ventricle. When the left ventricle contracts, blood passes through the aortic SL valve into the largest artery in the body—the aorta—to be carried and distributed to every area of the body. The heart muscle or myocardium is unique in that it is not under voluntary control (a person cannot cause it to start and stop at will) and it must work without ceasing for a lifetime. The myocardium requires a great deal of nourishment, and the arteries that feed it are the first to branch off from the aorta. These coronary arteries pass down and over the heart, providing it with an abundant and uninterrupted blood supply. Each heartbeat or heart cycle (also known as the cardiac cycle) is divided into two phases. The two atria contract while the two ventricles relax. Then, the two ventricles contract while the two atria relax. The contraction phase is known as systole, while the relaxation phase is known as diastole. The heart cycle consists of a systole and diastole of both the atria and ventricles. At the end of a heartbeat all four chambers rest. The pattern of heart chambers filling and emptying in sequence is controlled by a system of nerve fibers. They provide the electrical stimulus to trigger contraction of the heart muscle. The initial stimulant is provided by a small strip of specialized tissue in the upper area of the right atrium. This is called the sinoatrial or SA node. The SA node fires an electrical impulse that spreads across the atria, causing them to contract. The impulse also reaches another node, the atrioventricular or AV node. (The AV node lies near the bottom of the right atrium just above the ventricle.) After receiving the SA impulse, the AV node sends out its own electrical impulse. The AV impulse travels down a specialized train of fibers into the ventricular muscle, causing the ventricles to contract. In this way, the contraction of the atria occur slightly before the contraction of the ventricles. The electrical activity of the heart can be measured by a device called the electrocardiograph (EKG). Variations in the heart's electrical system can lead to serious, even dangerous, consequences. When that occurs, an electrical stimulator called an artificial pacemaker must be implanted to take over the regulation of the heartbeat. The small pacemaker can be implanted under the skin near the shoulder. Long wires from the pacemaker are fed into the heart and implanted in the heart muscle. The pacemaker can be regulated for the number of heartbeats it will stimulate per minute. Newer pacemakers can detect the need for increased heart rate when the individual is exercising or under stress. Heart disease is the number-one cause of death among people living in the industrial world. Preventive measures, such as an improved diet and regular exercise, are the best methods to overcome heart disease. a condition that eventually leads to heart failure. The defect can be corrected through a surgical procedure in which a patch is placed over the opening to seal it. does not receive enough blood and oxygen and its muscle cells begin to die. The primary symptom of this condition is pain in the upper left part of the chest that radiates down the left arm—what is called angina pectoris. A heart attack (myocardial infarction) occurs when blood flow to the heart is completely blocked. Numerous types of drugs have been developed to treat patients with heart disease. Some drugs are given to make the heart beat more slowly, removing stress placed on it. Other drugs cause blood vessels to dilate or stretch. This also reduces stress on the heart. A third important type of drug reduces cholesterol in the blood. Surgical procedures are often used to treat heart disease. One procedure is known as coronary bypass surgery. To supply blood to the coronary artery beyond the point of blockage, blood vessels are taken from other parts of the body (often the leg) and connected to the artery. Another commonly performed procedure is angioplasty, during which narrowed arteries are stretched to enable blood to flow more easily. The surgery involves threading a balloon catheter (tube) through the coronary artery and then stretching the artery by inflating the balloon. The most dramatic treatment for heart disease is the replacement of damaged hearts with healthy human or even animal hearts. The first successful human heart transplant was performed by South African surgeon Christiaan Barnard (1922– ) in 1967. The patient, however, died in 18 days. Many patients who received early heart transplants died days or months after the operation, mostly because their bodies rejected the new organ. In the early 1980s, effective drugs were developed to fight organ rejection. By the late-1990s, the one-year survival rate of patients receiving heart transplants was over 81 percent. For those who survived the first year, survival rates rose to over 90 percent. very good site. helped me alot with my research. i look forward to using this site again in the near future for other medical research assignments. The only thing I would suggest is to get more details in the information about molecules that exist in the plasma please. I think this is a great page. It helped me to get a grasp on the blood flow through the heart with great detail that i could actually understand. Thank you. This article has been very helpful to me, I really recomend this website to be visited by anyone that would like to learn more about heart problems and health itself. This is very informative, and it helped me alot with my school assighnment. Thanks!! I am a community health nurse teaching a class on heart disease. May I use your photo of plaque in the heart arteries in my Power Point for my inner city patients...it is for educational purposes only. Great article on haert. It is well written, simplified and accurate. Thank you for a fine artical on the heart and picture. If at all possible would youn be able to mention to me the name of a heart condition in which the heart fills with air and blood? A stress test indicated that my heart was filling with blood but also had air as well, and second do you think that this could have a relationship to SoQ2 reading or IgE results (i would be most glad to do further research by means of these medical names or listed conditions). Any information would be so helpful in allowing me to learn more about a possible condition i might have and by me doing as much research could possiblity only helps me understand what needs to be done. If at least the medical term for the heart and air condition, Thank you for the time given to this message. To all out in the world who cares about heart health, please find a good healthy heart diet. $ years ago I was lucky enough to survive an ugly episode of heart disease. To make it short, all 4 coronary arteries were 90%+ blocked. After a serious quadruple bypass operation in which they also replaced my mitrol valve I've just recently learned how to live a somewhat normal life. My EF is 20. Can't lift much more than 5 pounds, can't walk to far or fast, and finding new limits every day. All this right after working 30 yrs. and getting ready to retire in a few years. Well no need to say, the retirement came sooner then expected and life was something to figure out how to live different. Please, all who feel they may have some type of heart problem, get to a hospital ASAP. Ya', even you macho guys who say no, not me. I was 51, 6',170 pounds, and thought I was in the best of health. A little pain that felt like heartburn almost turned out to be death to me. Take care. GOOD care. My doctor says one wall of my heart has no movement. My blood pressure keeps dropping to 70 over50 or lower. I am always tired. What does that mean. I am going to a cardiologist Tuesday. Should I be worried .